Today my friends, is a great day. 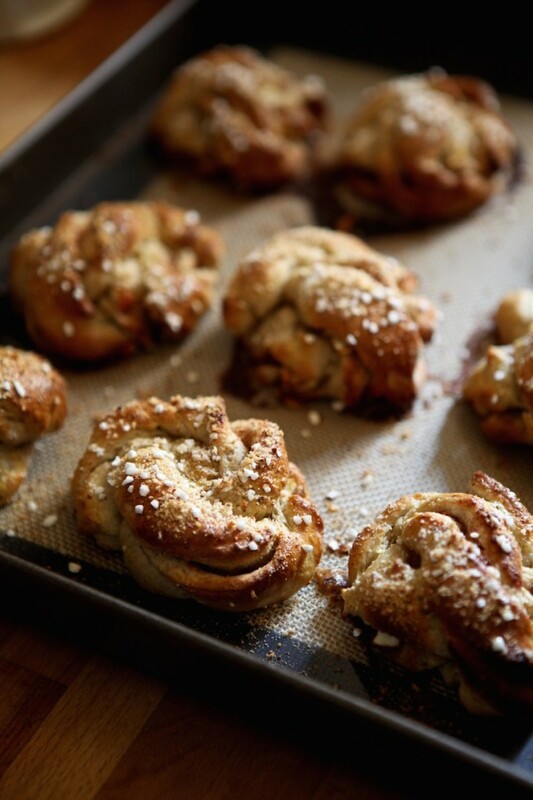 Yes, October 4th is the official Kanelbullensdag – the day devoted to the iconic Swedish cinnamon bun. 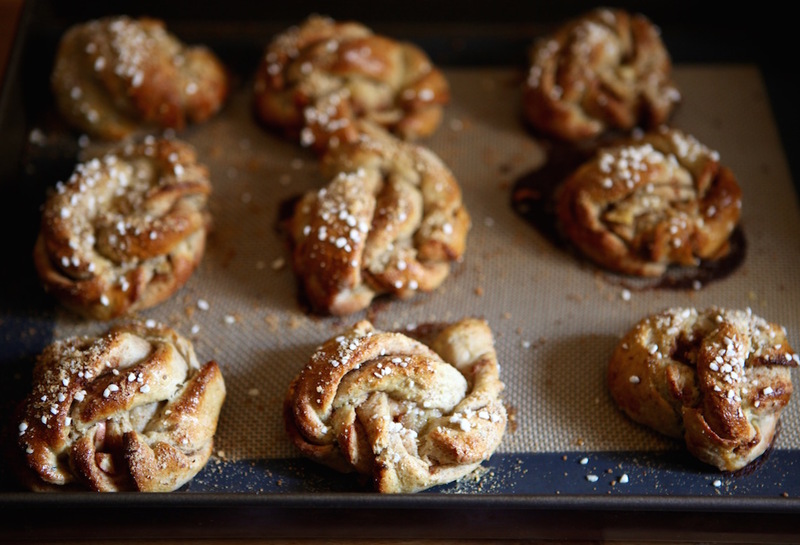 There’s no surprise that Swedish cinnamon buns get their own day. 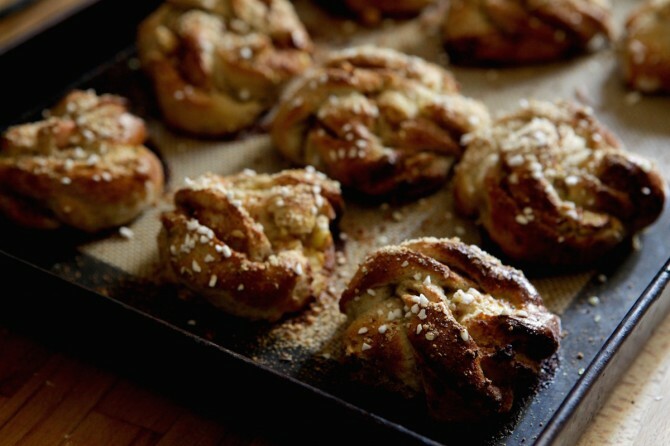 If there’s one recipe that would be iconic of Swedish fika it would be the kanelbulle, or perhaps, its delicious cousin, the kardemummabulle, a bun made with the same dough, just more cardamom. In honor of National Cinnamon Bun day, I decided to do a spin on the classic recipe that we have in Fika: The Art of the Swedish Coffee Break (kanelbullar are so important to Swedish fika, that it’s the first recipe that appears in the book). For a more seasonal taste, I added in apples, making for a bun that’s naturally sweet. 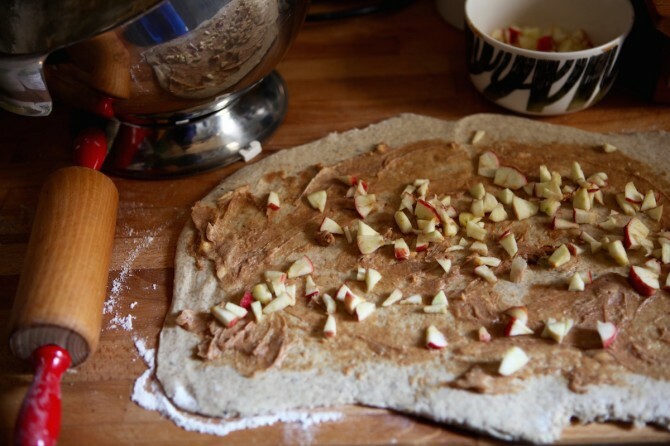 I like to make kanelbullar and kardemummabullar with a little rye flour in them, as I find it makes for a more complex flavor, which go well with the autumn apples. I also make these a little bigger than the original recipe in Fika, because let’s be honest; when it’s chilly fall weather outside and you are sitting down with a cup of coffee, you want a big kanelbulle. Make a batch and celebrate Cinnamon Bun Day! To prepare the dough, melt the butter in a saucepan; then stir in the milk and the honey. Heat until warm to the touch (about 110°F/43°C). In a small bowl, dissolve the yeast in 2 to 3 tablespoons of the warm mixture. Stir and let sit for a few minutes until bubbles form on top of the yeast. In a large bowl, mix together the whole wheat pastry flour, rye flour, cardamom, and salt. Add the yeast mixture along with the remaining butter and milk. Work together with a wooden spoon until you can make the dough into a ball. 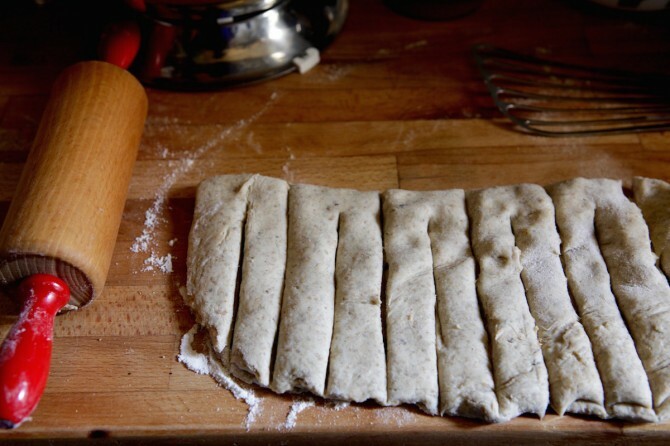 Transfer the dough to a generously floured flat surface, and knead it until smooth and elastic, 3 to 5 minutes. The dough should feel moist, but keep your flour bag close so that if it sticks too much to your fingers, you can add a little bit. Note that this dough has a tendency to be sticky, but you don’t want to overdo it on extra flour, so knead a few times and then use a spatula to scrape it off the flat surface, before kneading a few more times. This will keep you from having a crazy sticky mess. Continue this process until it has been kneaded enough. The dough is fully kneaded when you push on it gently with your finger and it rises back. Return the dough to the bowl, cover with a clean tea towel, and place in a draft-free place to rise until doubled in size, about 1 hour. Make the filling right before the dough has finished rising. Using a fork, cream the butter together with the honey and the spices until you get an evenly mixed, spreadable paste. Grease two baking sheets, or line them with silicone baking mat. When the dough has finished rising, take half of the dough and place it on a flat surface. Roll it out with a rolling pin to approximately an 11 by 17-inch (28 by 43-centimeter) rectangle. Place the rectangle on the surface so that the long side is closest to you. Carefully spread half of the filling on top of the rolled-out dough so that it covers the entire area; be sure to go all the way to the edges. Sprinkle half of the finely chopped apple pieces on top. If you want, you can also sprinkle on a bit of finely ground almonds or hazelnuts. Fold the dough in half, so that the top edge aligns with the bottom edge. Slice the folded dough into 9 to 10 equally sized slices. In the middle of each slice, make another slice, starting at the bottom and going to about 1/2-inch from the top edge, leaving a slice which has two “legs.” To make the buns, you want to twist both of these “legs.” Twist each side outwards, then cross them, bring the bottoms of the “legs” back up to the top and tuck them under the rest of the dough and pinch together. You can also tie them in a loose knot after twisting. If you want a visual of how to do this, click here. Don’t get too stressed about properly twisting, as long as you twist them into something that looks like a bun, and then tuck them underneath and pinch the dough together, you will be fine. Repeat with the second half of the dough. Cover the buns with a clean tea towel and let rise for 45 minutes. Preheat the oven to 435°F (225°C). When the buns have risen, carefully brush them with the beaten egg and sprinkle each with the pearl sugar and ground almonds. Bake for 10 to 12 minutes, until the buns are a deep golden brown. Remove from the oven, transfer the buns from the baking sheet to the counter, and cover with a tea towel to cool. Serve freshly baked, and if not eaten the same day as baked, store in the freezer once they are completely cooled. These look so pretty and sweet, like cinnamon apple pretzel buns! So yummy but much healthier!